The winner in 2011 when the tournament was staged in Kobe and three years later a repeat success in Yokohama; in Kitakyushu on Friday 8th June it was an opening round Women’s Singles defeat for Singapore’s Feng Tianwei. 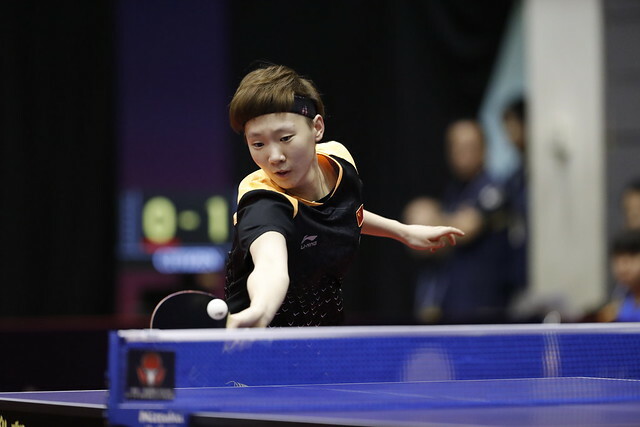 At the Seamaster 2018 ITTF World Tour Lion Japan Open, the no.7 seed, she was beaten by a most formidable opponent who, if in recent times had been subjected to more appearances on the international scene, would no doubt have commanded a direct entry to the main draw. Feng Tianwei was beaten by China’s Mu Zi (8-11, 9-11, 13-11, 11-3, 11-4, 11-7), bronze medallist at the Qoros 2015 World Championships in Suzhou. Disappointment for Singapore, for Romania it was mixed fortunes; Elizabeta Samara, the no.13 seed, experienced defeat at the hands of the host nation’s Minami Ando (11-3, 12-10, 11-8, 11-6); to balance the scales, Bernadette Szocs who had been required to compete in the qualification tournament, accounted for Hong Kong’s Doo Hoi Kem, the no.9 seed (10-12, 6-11, 11-6, 11-4, 12-10, 11-6). Two upsets, otherwise for the leading names it was success with the host nation very much in the lens of the camera. Kasumi Ishikawa, the top seed and Mima Ito the no.3 seed, both accounted for adversaries from Korea Republic. Kasumi Ishikawa beat Kim Hayeong (9-11, 11-1, 11-7, 12-10, 11-5), Mima Ito the no.3 seed, accounted Yoo Eunchong (11-7, 12-10, 11-6, 11-9). Similarly impressive, Miu Hirano, the no.4 seed, overcame Portugal’s Fu Yu (11-7, 10-12, 11-7, 11-9, 11-7), whilst Hina Hayata, the no.12 seed, beat Singapore’s Zhou Yihan (11-3, 12-14, 11-4, 11-6, 11-5). Notably Hina Hayata, who hails from the local area, had plenty of support; her headmaster alongside some 370 students from her school were in the tiered seating cheering every move! Success for Japan and there was notable success for China. Wang Manyu, the no.2 seed, accounted for Hong Kong’s Ng Wing Nam (11-7, 11-7, 11-6, 11-7), Chen Xingtong the no.6 seed, defeated the host nation’s Miyu Nagasaki (11-6, 11-4, 12-10, 9-11, 11-7). Likewise, Liu Shiwen, the no.8 seed, made her intentions clear; she ended the hopes of Britt Eerland of the Netherlands (11-4, 11-5, 11-2, 11-5). Meanwhile, not to be upstaged; amongst the leading names, Chinese Taipei’s Cheng I-Ching, the no.5 seed, caused the Singaporean camp more pain. She halted the aspirations of Lin Ye (11-7, 9-11, 11-9, 11-8, 11-2). The second round of the Women’s Singles event will commence later in the day.